Pr e s by te r i a n s To d ay | OCTOBER/NOVEMBER 2017 35 ministry — particularly to millen- nials — is key," said Nathan Adams of St. Charles Avenue Presbyterian Church in New Orleans. Adams leads the stewardship committee. "They want specifics and details. We used small-group presentations to keep our members informed." 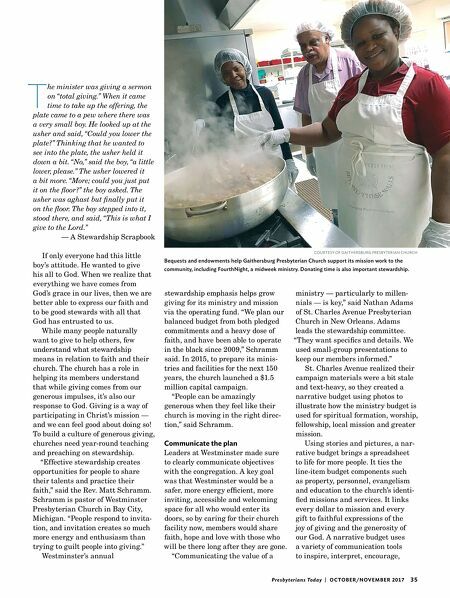 St. Charles Avenue realized their campaign materials were a bit stale and text-heavy, so they created a narrative budget using photos to illustrate how the ministry budget is used for spiritual formation, worship, fellowship, local mission and greater mission. Using stories and pictures, a nar- rative budget brings a spreadsheet to life for more people. It ties the line-item budget components such as property, personnel, evangelism and education to the church's identi- fied missions and services. It links every dollar to mission and every gift to faithful expressions of the joy of giving and the generosity of our God. A narrative budget uses a variety of communication tools to inspire, interpret, encourage, stewardship emphasis helps grow giving for its ministry and mission via the operating fund. "We plan our balanced budget from both pledged commitments and a heavy dose of faith, and have been able to operate in the black since 2009," Schramm said. In 2015, to prepare its minis- tries and facilities for the next 150 years, the church launched a $1.5 million capital campaign. "People can be amazingly generous when they feel like their church is moving in the right direc- tion," said Schramm. Communicate the plan Leaders at Westminster made sure to clearly communicate objectives with the congregation. A key goal was that Westminster would be a safer, more energy efficient, more inviting, accessible and welcoming space for all who would enter its doors, so by caring for their church facility now, members would share faith, hope and love with those who will be there long after they are gone. "Communicating the value of a T he minister was giving a sermon on "total giving." When it came time to take up the offering, the plate came to a pew where there was a very small boy. He looked up at the usher and said, "Could you lower the plate?" Thinking that he wanted to see into the plate, the usher held it down a bit. "No," said the boy, "a little lower, please." The usher lowered it a bit more. "More; could you just put it on the floor?" the boy asked. The usher was aghast but finally put it on the floor. The boy stepped into it, stood there, and said, "This is what I give to the Lord." — A Stewardship Scrapbook If only everyone had this little boy's attitude. He wanted to give his all to God. When we realize that everything we have comes from God's grace in our lives, then we are better able to express our faith and to be good stewards with all that God has entrusted to us. While many people naturally want to give to help others, few understand what stewardship means in relation to faith and their church. The church has a role in helping its members understand that while giving comes from our generous impulses, it's also our response to God. Giving is a way of participating in Christ's mission — and we can feel good about doing so! 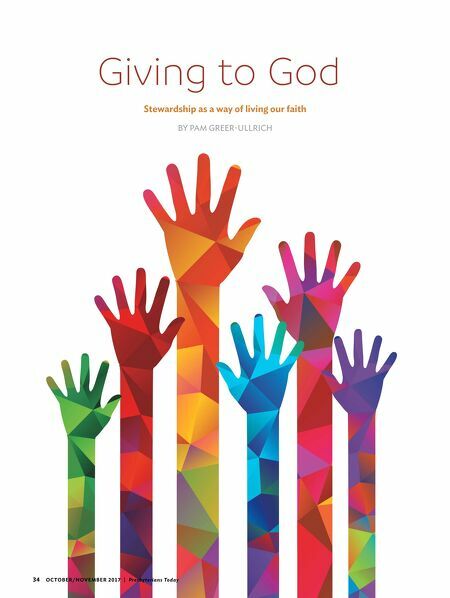 To build a culture of generous giving, churches need year-round teaching and preaching on stewardship. "Effective stewardship creates opportunities for people to share their talents and practice their faith," said the Rev. Matt Schramm. Schramm is pastor of Westminster Presbyterian Church in Bay City, Michigan. "People respond to invita- tion, and invitation creates so much more energy and enthusiasm than trying to guilt people into giving." Westminster's annual COURTESY OF GAITHERSBURG PRESBYTERIAN CHURCH Bequests and endowments help Gaithersburg Presbyterian Church support its mission work to the community, including FourthNight, a midweek ministry. Donating time is also important stewardship.